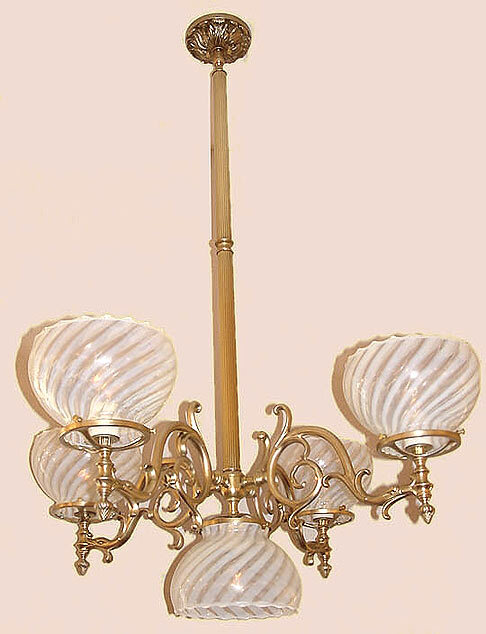 Continuing with our 'Dolphin Arm' series, we find this amazing 4 arm / 5 light chandelier. See how the cast brass arms flow, leading the eye towards the shades. If you prefer to have no downlight, just tell us at the time of your order. We can place a lovley 4 in. ball or double ball in its place. (This glass shade is no longer being manufactured). Goes well in the kitchen to match our NCH27 in adjoining dining room. Shown in Brushed Brass. Available in different Metal Finishes, different Glass, Back Plate, more or fewer arms, arm direction, tubing style and many other Custom Options.